Austrian towns and cities easily rank among the most colorful towns in the world, and its the color of those towns that make them so pleasant to walk through. And Wels, located on the Traun River just a short hike west from its confluence with the Danube, easily ranks among the most colorful of them because of the city layout — a series of tightly-packed streets with each building a different shade of pastel. The first photo gives you an idea of what I am talking about. Wels is a stride off the beaten path, just enough that it doesn’t draw a much attention as nearby Linz, but not so far away that it still attracts people (though not so many due to the hordes of people whom I encountered at the Wels train station headed for the Linz City Festival). The first and second photos show the Stadtplatz from different directions, and this is clearly the place to start. It is a fairly long street with the Leiderturm (an old city gate) at one end and the Stadtpfarrkirche at the other, with fancily-decorated building after fancily-decorated building in between. I could have chosen any of a number of them for a picture unto itself, they were that nice. One, however, was worth special mention. In the first photo, note the yellow building at left that contained a large number of flower boxes. That is the Neues Rathaus, or new town hall, and it is a very handsome building indeed. The second photo shows the Stadtplatz in a different direction. In the middle was an avenue called the Hafengasse going further in. The Hafengasse and nearby Schmidtgasse across from it were loaded with picturesque shops. 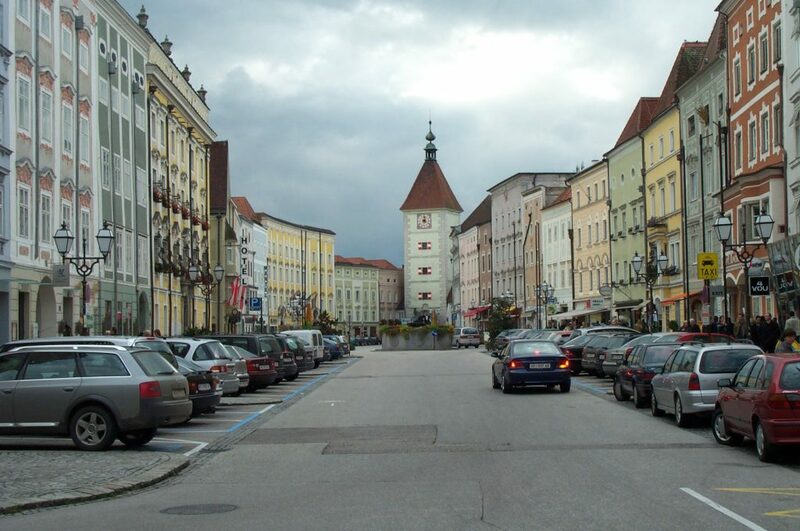 These avenues are every bit as colorful as the Stadtplatz, but have been renovated so they look brand new and fresh, and the shopping there is definitely modern, bordering on upper-crust. The Hafengasse leads to the Altstadt, although this name was a bit deceiving. In most places, ‘altstadt’ indicated the ‘place to be’. Wels’ Altstadt was reduced to just a single street, with only a hint of the original city wall remaining. But a significant structure remained, the Kaiserliche Burg,shown in the third photo. 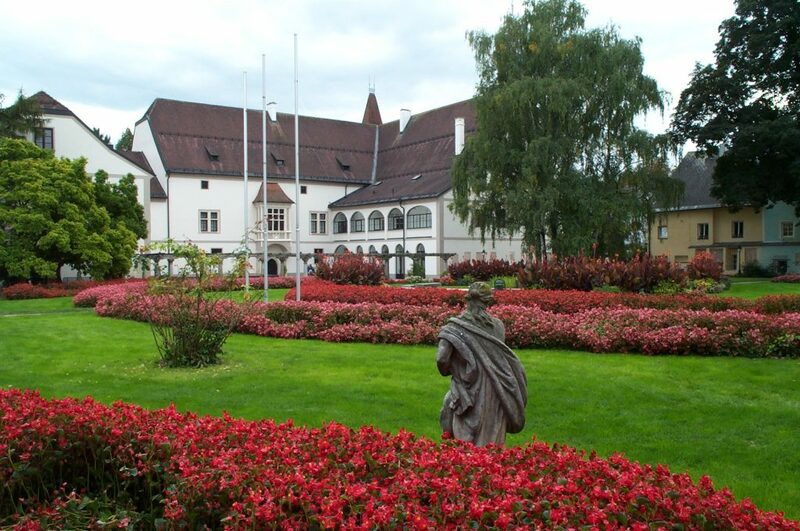 Now a minor museum, this palace has been dressed up in beautiful white and sports an absolutely gorgeous garden. The surrounding buildings are colorful and decorative, and the entrance gate is lavishly decorated. The Altstadt is about a block away from the Traun River, which thankfully has been left pristine. That is, from the bridges crossing the river, you could not tell that there was a major city nearby. Probably a good thing, because the high banks suggested that this river experiences occasional flooding (such as in the fall of 2002). Helping to relieve some of the pressure are a series of canals than run through the downtown (and they were a tad high on the day I went). One of these canals passes the altstadt, and borders the city’s park. The scene in the fourth photo was taken from that park — it is the rear of the Minoriten Kloster, the minority convent that abuts the Neues Rathaus. The building has been converted to an art museum and combined with more modern architecture, but I was pleased to see that the rear of the building was largely left alone. Continuing back toward the train station, I came upon Kaiser-Josef Platz, which parallels the Stadtplatz both in geography and style. It contains the main bus depot of the city, and more of its colorful and elaborate architecture. The fourth photo below shows one such building from it, and yes those reliefs were all sculpted, not painted on. (The building was not specifically identified that I could tell, but once I get a chance I’ll seek it out on the web.) 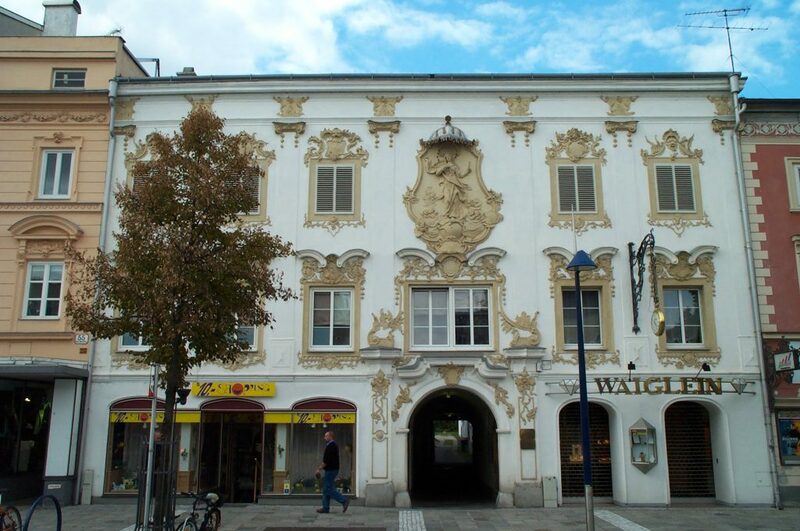 That building was the best example of the great facades one would find in Wels. There were several other places I visited in Wels worth noting. The Stadtmuseum was impressive. It resides in a converted Transylvania-style house made of red brick and two asymmetric (and somewhat ungainly) concrete towers. Across the street from the museum were a series of memorials, some honoring Austrian war heroes, others commemorating specific events. Finally, a block away toward the river, is the Wels Convention Center which was busing hosting an event of its own, and near it were a couple shopping malls that seemed to cater to the locals. It was clear that the city of Wels has a proud history beyond architecture. 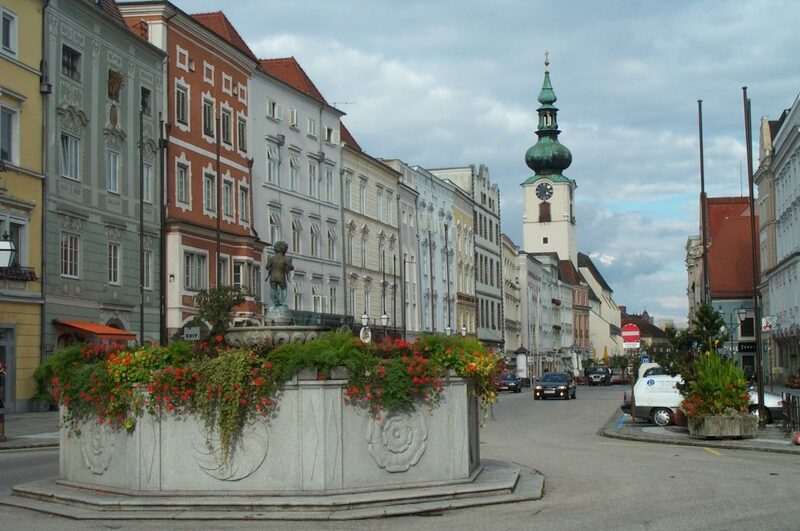 As I said at the top, I love walking through Austrian cities, and the beautiful city of Wels shows why. 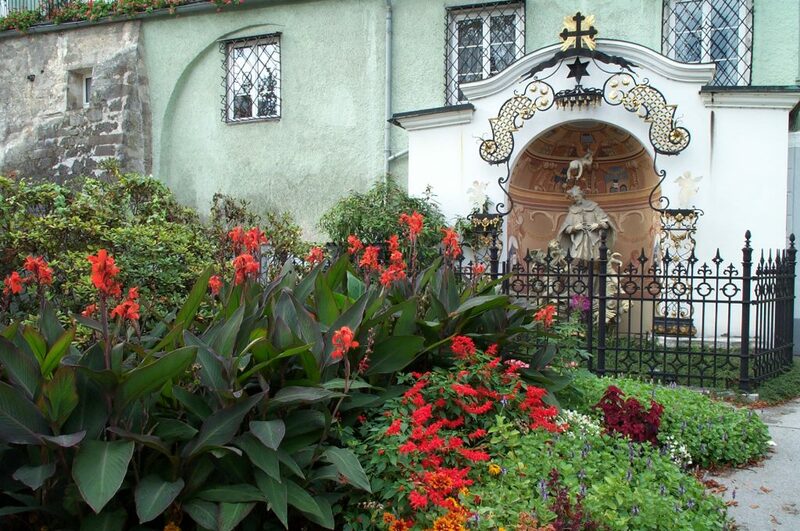 Wels was colorful and cheerful, with each building a scene unto itself. It was one of the most enjoyable half-day excursions I’ve ever spent.